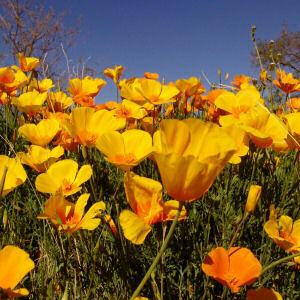 In her article, California's Esteemed Golden Poppy , Naomi Mathews writes "...the California Poppy won the esteemed title of 'Official California State Flower' by an overwhelming landslide." The showy Matilija poppy (also called the giant poppy) received no votes and the beautiful Mariposa lily received only three votes. It took almost 13 years for the California Legislature to get around to adopting the winning golden poppy as the California State flower. The golden poppy, Eschscholzia, was selected as the official State flower of California by an act of the Legislature on March 2, 1903. 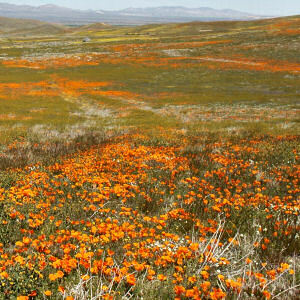 In 1973, the law was amended to designate April 6 of each year as California Poppy Day. The following information is excerpted from the California Government Code , General Provisions, Title 1, Division 2, Section 421. Eschscholzia californica: Southern California Wildflowers and Other Plants: Photographs by Michael L. Charters. About the Golden Poppy: Information about cultivation of the golden poppy from BackYardGardener.com.